Adjustability for increased personal comfort and productivity. Monitor and keyboard shelves adjust in 5" range. 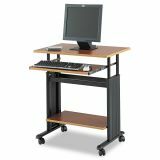 Safco Adjustable Height Workstation, 29-1/2 x 22d x 34h, Cherry/Black - Adjustable workstation saves space and secures your CPU and printer with a heavy-duty, powder-coated steel frame, melamine laminate and 3/4 thick compressed wood shelves. Height adjusts from 29" to 34". Keyboard shelf adjusts up to 5", extends 9-3/4" and holds up to 25 lb. Keyboard shelf retracts under the worksurface when not in use. Printer shelf adjusts up to 1" increments. Decorative molded, snap-on side panels hide computer cables for a clean appearance. Workstation includes four casters (two locking) for easy mobility. 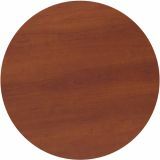 Worksurface measures 29-1/2" wide x 19-3/4" deep. Keyboard shelf is 23" wide x 13" deep. Printer/CPU shelf measures 23-1/2" wide x 13-1/2" deep." 23 1/2" wide printer shelf adjusts in 1" increments.